Matt Smith Comic Con 2012. . Wallpaper and background images in the Matt Smith club tagged: matt smith doctor who comic con 2012. 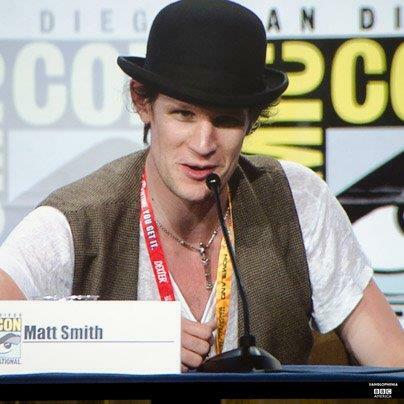 This Matt Smith photo contains 软呢帽, 毡帽, 斯泰森, fedora, homburg, trilby, 洪堡, and 斯泰森帽. There might also be 标志, 海报, 文字, 黑板, 文本, 船工, 里窝那, 巴拿马帽子, 水手, 撇油器, 草帽, 船头, leghorn, 巴拿马, 巴拿马草帽, 撇乳器, 撇渣器, 街道, 城市风貌, 城市环境, 城市场景, and 城市设置.